Brian writes: One of my fondest winter memories is of growing up in a suburb of Toronto, in snowy Ontario, Canada. From kindergarten to the third grade I went to an elementary school just down the street, along a very safe road, and I used to walk to and from school by myself. During the winter, our Toronto suburb would get quite snowy, and the combination of people shoveling their snowy driveways and the snowplow driving past peoples’ properties and piling big ridges of snow along the side of the road meant that some very tall piles of snow would end up in peoples’ driveways. 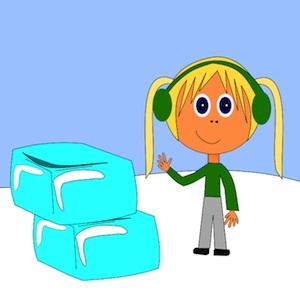 Normally, my walk home from school would take 15 to 20 minutes… but during the winter, sometimes the walk would take me an hour or two, as I’d be scrambling up and throwing myself down all of the mountains of snow that I could find! Here are some math games that you can use as math centers in your classroom. The goal of these games is to make math learning fun while challenging students to use their creativity and analytical skills in the activities provided in the packet. 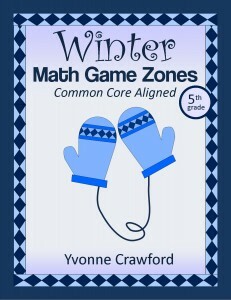 Each game is aligned with one or more Common Core standards. If you click on the links provided you’ll be taken to a storefront where you can download a preview of the math centers if you’re interested in learning more about them. Common Core standards: 1.OA.6, 1.NBT.1, 1.NBT.1, 1.NBT.3, 1.NBT.5. Common Core standards: 2.OA.3, 2.NBT.3, 2.NBT.4, 2.NBT.5 2.NBT.8. Common Core standards: 3.OA.3, 3.OA.7, 3.NBT.2, 3.NBT.3, 3.NF.3. Common Core standards: 4.OA.4, 4.OA.5, 4.NBT.3, 4.NF.5, 4.NF.6, 4.NF.7. Common Core standards: 5.NBT.3, 5.NBT.4, 5.NBT.7, 5.NF.1. Keep warm this winter, if you can! And just so you know… while I’m typing this, I’m sitting on the sofa at our house in France, near a nice, cozy fire!